I have written about the benefits I have gained from using 750words.com a number of times (see the list here). 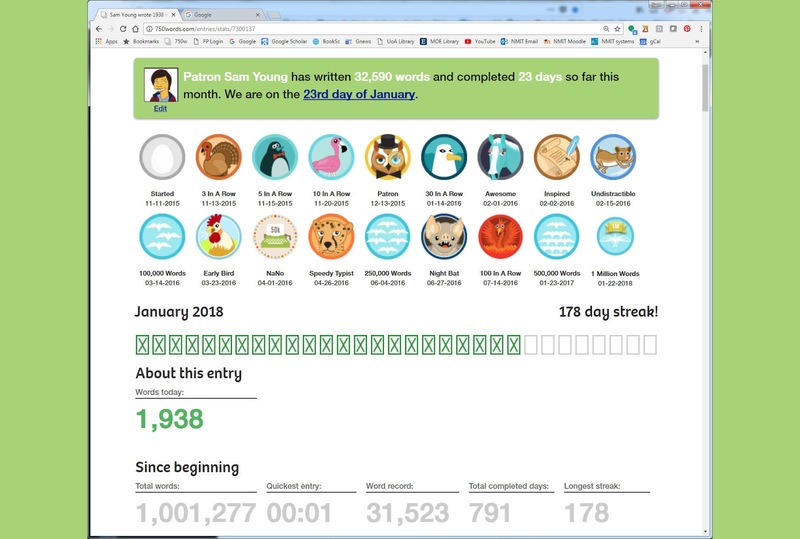 However, a couple of months ago, I realised that I had clocked up one million words on my 750words.com odometer since November 2016. That's roughly half a million words deliberately written each year... by me. Of course, it is unstructured, unpolished, full of mistakes and doesn't have any particular central theme (unless you count me as being at the centre of it). I couldn't sell it - ie, I am not an author - as it would be meaningless to anyone else. But it helps me to make sense of my world, and to keep track of progress: in the main, being used as a combination 'to do' list, a 'have done' and a 'have felt' list. At the outset, I decided that those daily entries would be as long as I needed to tease ideas out. I wouldn't limit my daily output to 750 words, but would write until I had reached a logical conclusion. This approach seems to work for me. There have been days early on where I lost the plot at two hundred and fifty words and couldn't push through (some days where I copied my grocery list in, or recited numbers!). But there are days now when I realise that two hours have melted and I have done two or three thousand words. Not only is a million words a staggering amount to write, but it made me realise that it is probably less than a quarter of the amount that I write each day: the rest being written as emails, professional and social media posts, blog entries, articles, course outlines, teaching instructions, procedures, policies, development documents and client notes. 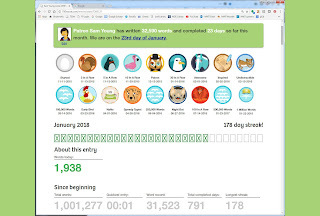 I figured that I probably write well over two million words a year. Fascinating. So "Thank you!" Buster & Kellianne, and here's to another million!